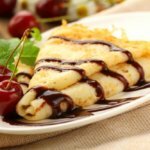 Crepes make a great breakfast or brunch, and the sky is the limit when it comes to filling and presenting classic French crepes. Why not add strawberries, raspberries or blueberries, along with some whipped cream? Another idea is Nutella and banana slices, or you might prefer to keep things simple with lemon juice and powdered sugar. 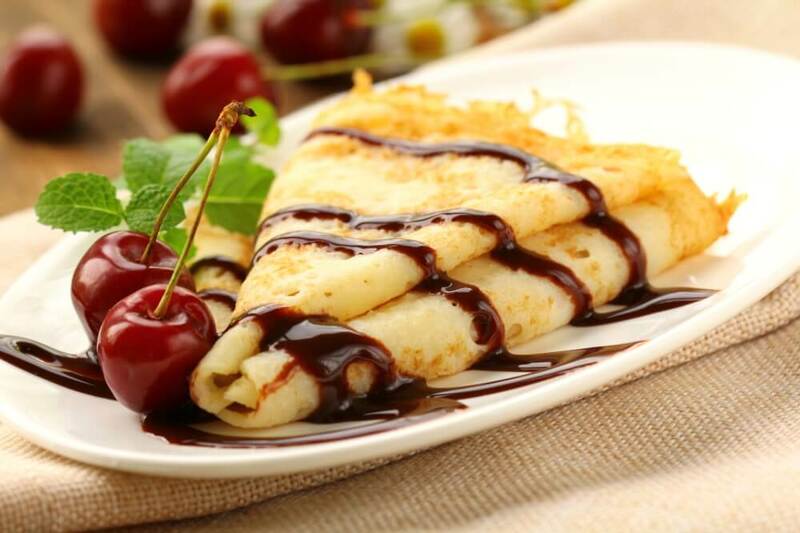 You can even turn classic French crepes into gallettes by using a savoury filling like chicken salad, shredded pork and applesauce or eggs and bacon. Use your imagination when coming up brand new twists on this easy dish. As you can see from our recipe you don't need many ingredients - just flour, egg, milk, sugar and salt. You might want to leave the sugar out if you are considering a savoury filling, or you could swap it for artificial sweetener if you prefer to use that. Once you have combined the ingredients to make a batter, you just need to heat a little oil in a pan then cook the crepes one by one. If you're making a lot, keep them warm in a warm oven. 1. Mix the sugar and salt with the flour. 2. Make a well in the centre then add the egg and milk. 3. Now beat well to combine. 4. Heat a greased skillet over a moderate to high heat. 5. Pour the crepe batter in there, using about 60ml for each crepe. 6. Tilt the pan around so the batter coats the pan's surface. 7. Cook for 2 minutes or until golden on the bottom. 8. Use a spatula to loosen the crepe and flip it over. 9. Cook the other side, then serve hot with your chosen filling.